Crown lifting involves pruning to achieve a desired vertical clearance above ground level or other surface. This is sometimes necessary to facilitate site usage. 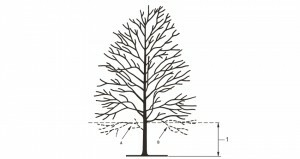 If a tree hangs over a road there must be 4-5 metres clearance between the lower part of the canopy and the road. This clearance is 2-3 metres when the tree hangs over a pavement. In some instances crown lifting can be preferable to reduction if the main aim is to create more light and space.